The Sidi Discovery Rain Boots feature some state-of-the-art footwear technology. They're designed so that they don't need to incorporate inner "booties," making the actual design of the boot smaller and less cumbersome, and also making shifting easier because you can feel the shifter peg. The buckles themselves have been copied by other manufacturers because of their ease of use. They only need to be adjusted once, and the Cam-lock buckle system will remember where it was set at for years to come. 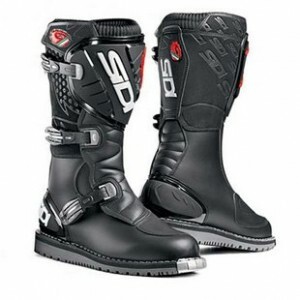 The Sidi boots are equipped with an anti-heat leather protection panel located at the same height as most motorcycle's exhaust shields too, so no worries about burning yourself. The lining is made out of Cambrelle, which is known for its quick drying ability as well as its ability to wick away sweat. One nice thing that's a little uncommon for boot manufactures is that they make replacement parts available, so if you take a spill and damage a strap, you don't have to buy a whole new pair of boots. Just buy the replacement part you need and swap them out. It's available in men's sizes up to 14 US and as small as a 3 US.